If you have been wondering how Sony's first phablet and the phone with the largest screen ever will look like, you don't have to wait until tomorrow, as what claims to be photo of it leaked out. The pics show a pretty large bezel top and bottom, which, if the phone is indeed with a 6.44" screen, would be a big hurdle to portability and manageability, explaining why it appeared serving as a kitten holder recently. Also, in line with the rumor that it will sport a screen tech that allows you to doodle with a regular pen or pencil on it, instead of a dedicated stylus, the hand in the picture seems to be drawing on a Post-it note stuck to the display, instead of on the actual screen. The second leaked handset in the pictures below that Sony is supposed to unveil tomorrow, is said to be the Xperia SP for China, with quad-core MediaTek processor and dual SIM capabilities. Sony is also said to unveil a smartwatch of its own, so tune in tomorrow when all mysteries will be cleared. A real good innovation ahead of us in screen technology. Happy to see SONY taking a good initiative. The S Pen gives you much more functionality than a pencil would. There is the hover feature for previewing videos, photos, and website sub-menus. You can also add different pens, pencils and brushes all with different colors with a S Pen. And who keeps losing S Pens? Set the alarm on it, and it will let you know your leaving it behind. S Pen is far superior to a simple pencil, but it would be cool to be able to use both. Sounds cool, but not into Sonys. Just think it would be better to have both options. Tweek the UI a little and I would consider it. I don't hate Sony, they just haven't put out anything I'd like to spend a few hundred bucks on. As the previous commenter noted it is easier to replace a pencil than it is a stylus. Also, it would be better to write with than a regular stylus. The stylus that comes with the Note is just too small to be able to write comfortably for anything longer than a quick note. I have big hands and although I thought it would be a problem at first, I've found the S Pen is very comfortable to write with. I even prefere it to typing at this point. Really. I just wanna see how does a simple "pencil" would compete with Stylus. Stylus is small, I know. Hard to use. 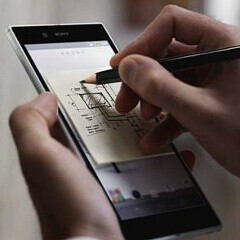 But stylus has many features and functionality May be Sony has something innovative this time. S Pen? No thank you. I have Pencil! Can I use with my Potato? Only iPA could not understand the 1st and 2nd pictures are of different devices. The laughing stock of the tech world. The camera is left of the middle on the first picture. The second picture is likely to be the rumoured low end 5 incher for certain markets.